Calme et confortable LOG CABIN, les étapes de la rivière dans BELLE Wisconsin Nord! Voici votre escapade en cabane en rondins dont vous rêvez! Assez rustique pour être dans le Nord, mais il a encore tout le confort moderne de la maison! Étapes vers la rivière Lily (nourri au large de la rivière Wolf); entouré par des acres et des acres de belle forêt et de l'âge sentier de glace seulement miles de là. Le premier étage de la cabine dispose de deux grandes chambres privées (lits complets) avec lits en bois faits à la main, salle de bain complète et cuisine confortable avec cuisinière électrique, réfrigérateur, four à micro-ondes et tous les ustensiles de cuisine. Le salon est complet avec de nombreux sièges confortables, système TV / DVD et foyer au gaz. Le loft situé au 2ème étage dispose de deux lits jumeaux faits à la main, recouverts de grange, et d’un coin salon calme doté de grandes fenêtres donnant sur la forêt et la rivière. Beau grand pont enveloppant avec gril à gaz en acier inoxydable. Beaucoup de places pour profiter de la nature tout autour de vous, et un moustiquaire, belvédère éclairé distincte pour ces cocktails de fin de nuit ou les jeux de cartes par le feu. Près de bons restaurants, terrain de golf et casino. Rafting sur la rivière Raging Wolf en été et sentiers pour la motoneige et le ski. Nous sommes situés à 15 miles de Lakewood, Wisconsin et à 5 miles de Pickerel Wisconsin! Emplacement fantastique, privé et calme! Près de grand terrain de golf à seulement 4 miles! De nombreux restaurants et bars à proximité Petite épicerie disponible 4 miles. Kettlebowl Ski Hill 5 miles! Ice Age repérages 1 mile away! Cabin est non fumeur à tout moment! I surprised my husand with a getaway to the cabin in Lily. I was looking for something cozy, clean and private. I wanted truly disconnect from the world for a few days. This place checked all of those boxes and then some. We slept in, drank coffee by the river, made some meals together in the fully stocked kitchen, and just relaxed. The Brewers were in the playoffs, and since the cabin TV only got a few channels (this was actually a plus for us) we ventured down to Joe's bar which was about a mile down the river to watch the game. My husband and I talked about how fun it would be to return with our three children in the summer. 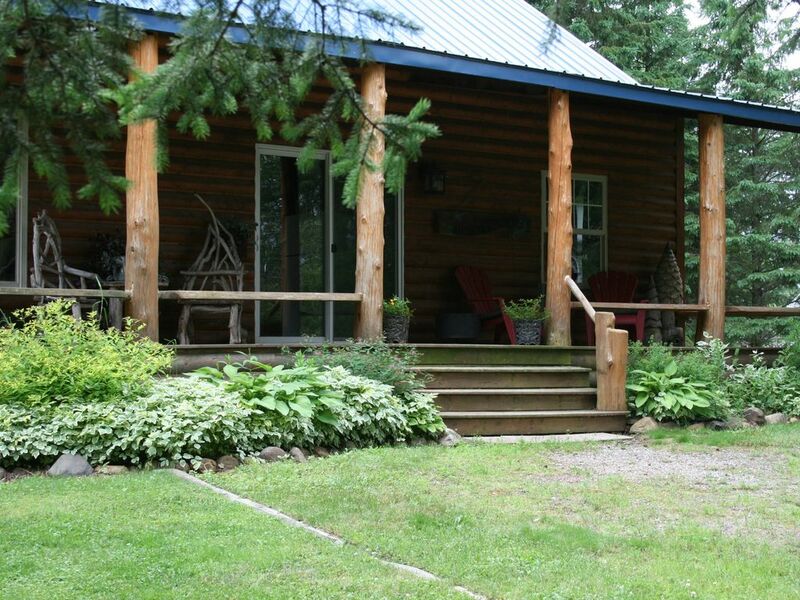 If you are looking to unwind, unplug and enjoy the ones your with, the cabin in Lily wont disappoint! We had a great time! The cabin was just as advertised. The river was just steps away and so scenic. We were interested in hiking the Ice Age Trail, and the location was perfect. Fire pit was used often and the inside of the cabin was just beautiful. Hope to come back!!! We have stayed at the cabin twice now (in July and in September). It is a great looking cabin with a perfect location. You step out onto a side deck and you have stairs down to a river with the clearest water I have ever seen. There is a place for a bonfire right by the side of the house. It is a perfect place to get away from your everyday life, forget the stress and just enjoy your company. We will definitely be going there again. Great cozy cottage. Everything you need. Beautiful location next to a peaceful river. Very nice cabin decor. It was a wonderful place to get away from it all. Peace and nature all to yourself! What a lovely, charming and peaceful property. Owner is attentive and available if and when you need. The property is clean, well maintained and has everything you need. All the beds were comfortable and clean (did i already mention that it was clean?!) The river right next to the home is beyond beautiful and peaceful. The firepit was perfect and the gazebo is perfect for a day nap outside without the bother of mosquitoes. We were there for our annual girls weekend, their were six of us and we fit perfectly. This place is cozy yet spacious. We spent the time mostly catching up around the fire and river but was also able to enjoy some river tubing just a short 20 minute drive. We will definitely be back soon! Once again, thank you for sharing your home! Oh, we left a pair of shoes and the owner was so kind as to ship them to me. AMAZING!